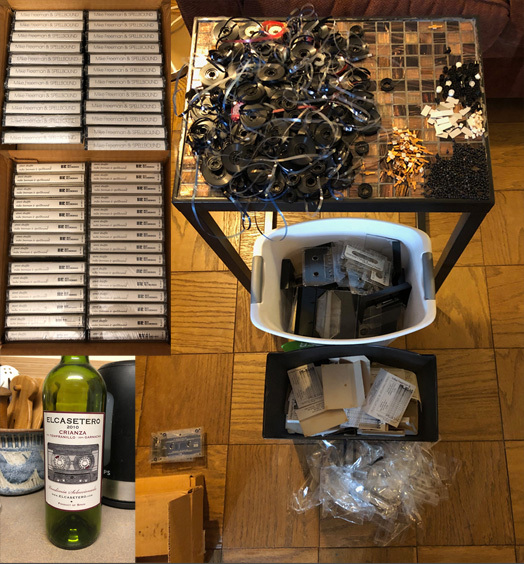 Several months ago I started asking the question of what to do with a stock of legacy cassettes, from back in my Spellbound days of the 1980s-90s, that I had been storing in my closet all these years. With the help of a bottle of Elcasetero watching over me, I finally came to difficult decision to break them apart to recycle the paper, plastic, metal etc. It was a total pain (each cassette has 5 screws) but was the right thing to do for the environment!